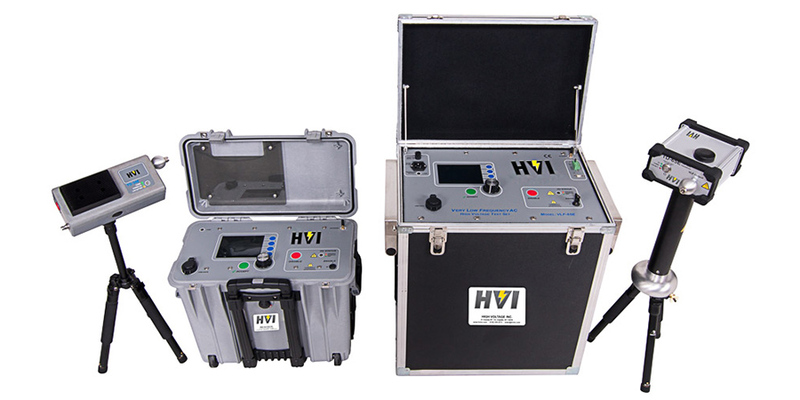 HVI has led the industry in manufacturing the most portable and easiest to use VLF test instruments since 1998. The E Series represents the apex of these efforts with the most advanced features and highest reliability of any cable testing system on the market today. This series offers a digital alternative to the VLF Series for performing AC withstand testing and off-line, elevated voltage insulation diagnostic testing. Rugged and reliable, the E Series makes VLF testing faster and easier than ever before. The two models in this best-selling series operate at 0 – 34 kV AC and 0 – 65 kV AC peak voltage with sinusoidal output. These versatile test sets offer VLF and DC output, sheath testing, and cable fault burning. No PC is required for VLF or TD testing, but using one enables full remote control of testing, output, and data upload with HVI’s E-Link software. Both models include a USB port for exporting data, and internal memory can store 100 test records of up to 5 hours each. Data is stored automatically in VLF memory with optional backups to USB and PC. XBee wireless connects all components (including optional HVI tan delta instruments), offering a broader range and better signal sustainability than products equipped with Bluetooth. The 34E is a new generation VLF AC hipot that uses a solid state design with microprocessor controls. It meets the requirements of applicable world standards regarding cable testing up to 25 kV class maintenance testing. Compact and light, this instrument is highly portable and deftly handles cable testing needs while conserving space in your field vehicles. Its sine wave output is suitable for using optional external tan delta and partial discharge detection equipment. The 65E is the latest addition to the new generation of VLF AC hipots from HVI. Test programming, output functions, wireless communications, and data retrieval are intuitive and easy to learn. This instrument is designed for the rigors of field use, like all HVI products. Its 0 – 65 kV AC output voltage meets world standards for acceptance testing up to 35 kV class cable, and its sine wave output is also suitable for using optional TD and PD measurement systems. The E Series meets the following standards: IEEE 400.2, IEEE 400, IEC 60060-3, CENELEC HD 620/621, VDE DIN 0276-620/621, and IEEE 433 for motors/gens. Contact HVI sales at 518-329-3275 or email [email protected] for pricing and additional details about the VLF E Series.